New adidas collection for running. love running and keeping fit by wearing stylish and highly technical items. adidas running produces high quality running apparel and shoes, all of which are always available in the specialized online store. Whether it's shoes or technical running clothing, with adidas you'll always feel at home and you can count on inimitable style and design. The adidas running collections are distinguished by a wide range of running shoes with technical details with high technology and design. Models with modern materials designed to improve the performance of professional runners or those who love to run for simple passion. The adidas running garments are instead so versatile that they can be worn for runners' workouts as well as for gym sessions. Discover the running world of adidas! adidas is one of the world's largest manufacturers of running shoes. In the adidas Running collection you can find running shoes to venture on any terrain, from the track to the asphalt, to trail running. A collection aimed at all types of runners, both those who have been racing for years and those who run for the first time. Thanks to the technical designs suitable for every style of running, adidas running shoes allow you to reach your goals, even the most ambitious ones. 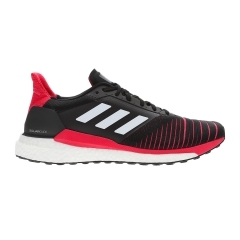 On Mister Running you will find the whole range of adidas running shoes, we select for you the best proposals of every season, from the most famous models to the latest news. Discover the adidas SolarBoost models, high performance running shoes to move safely at any speed and at any distance. Do you prefer to run on difficult paths and venture on unexplored routes? Terrex are the adidas trail and outdoor shoes suitable for you: highly technical and with specific technologies to offer lightness, grip and protection. In the Mister Running online store you can find all the adidas running clothing always ready for delivery and in all the available colors. You can buy the brand new adidas technical Climachill t-shirts or the practical wind and rain jackets, the comfortable running shorts or protective tights for the winter. Choose a style and compose your new running suit with the colors of the season, you'll always be trendy and you'll stand out everywhere while running. The adidas running garments are lightweight, breathable and flexible, to run longer and with maximum freedom of movement. The adidas Running clothing is created to improve your performance, innovative technologies ensure freshness even during the most demanding races. And then complete your look with the right adidas running accessories. Caps, gloves, socks and backpacks are essential to complete the kit of a true runner.